Was it Aylu who singlehandedly introduced Chicago footwork to the South American continent? Yes. Maybe. I don’t know. Who can really take credit for something like that? It’d be like me introducing my family to spaghetti or something. Makes no difference, or sense. Regardless, Aylu has singlehandedly brought Chicago footwork to Argentina, wrapping its rapid polyrhythms in her own signature style. 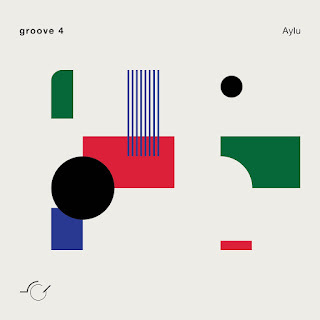 It’s fitting, then, that “groove”-y Wrocław tape label outlines has included Aylu in its, ahem, “groove” series, as “groove 4,” this here tape, constitutes the first in a trilogy of forthcoming releases dedicated to female producers. Never one to seemingly shirk a forward-thinking footwork-indebted artist, the label’s done a nice job adding Aylu to its catalog. I’ve gone on record saying that it’s impossible to resist the movement of outlines’s artists, and here it’s not different – Aylu takes ordinary objects and sounds and pieces them together, like me with a bunch of my sons LEGOs after I stumble through them like a great lummox. But the precision and inventiveness these sounds are put together with takes much more effort, more care, and more vision. The ping-ponging disintegrations of soundwaves, the voice patches, the melodies surfacing and submerging – all coalesce into a weird, wild whole. It’s almost like you’re listening to it wrong, the nine minutes of each track stretching out as linear time – if you adjust your position on the space-time continuum, you may find that the tracks halve themselves but sound like a full orchestra. Is that the secret, knowing this is a deconstruction of a different whole because we perceive time in a linear manner? Did I just suggest Aylu was some sort of being existing outside of linear time? Anyway, have fun with this one. I sure did.